We’ve had to travel at the height of European vacations because our window of free time was so limited. With Jimmy teaching in Tampa this summer and Boston in the fall all we had was now…so here we are! Where, pray tell? Well, after battling two hour lines in Athen’s airport we boarded our flight to Mytiline; a quick flight of only 45 minutes with sun shining through the windows reflecting off the waters down below. It’s truly one of the most enjoyable flights. 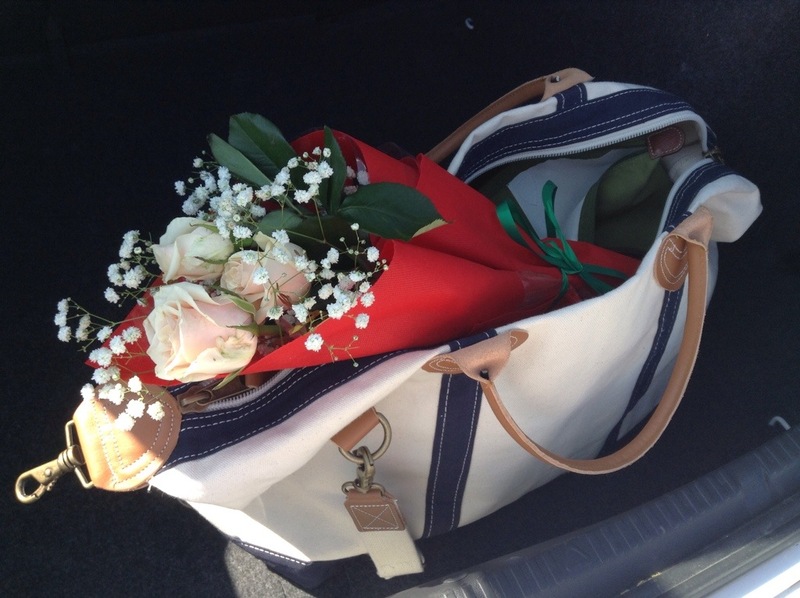 Jimmy’s cousin, Athena, met us at the airport…with roses…to celebrate our anniversary. Is that incredibly thoughtful or what? 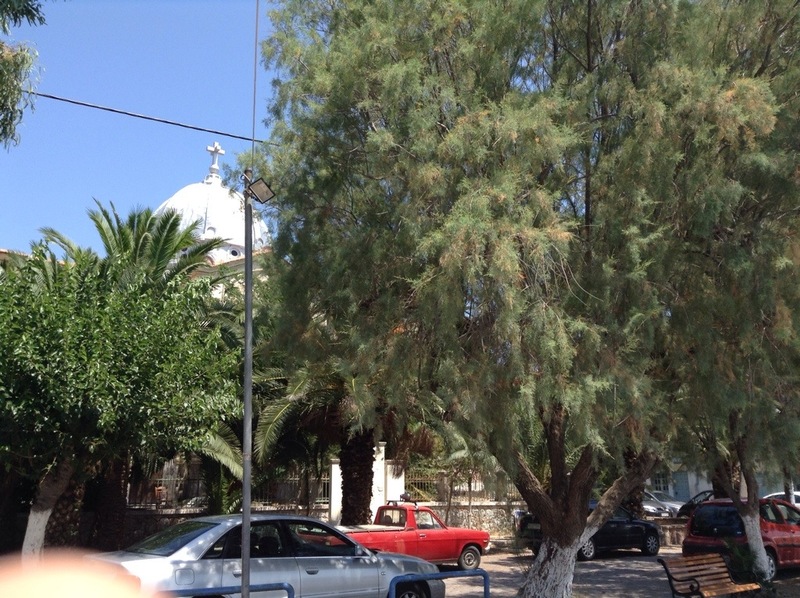 We then met some more family members in a small water-front town by the name of Panayiouda. It’s a true gem of a town gleaming on the water but hidden from most. Here…..I’ll show you. The streets are cobble stone down to the sea wall. Small and medium size boats bob in the water as cats watch for kind restaurant patrons to toss them a fish bone or french fry. I didn’t tell you about the fish? I am so sorry! Well, I’ll tell you…it puts Fort Lauderdale to shame. There are more kinds of fish here than you can shake a stick at! 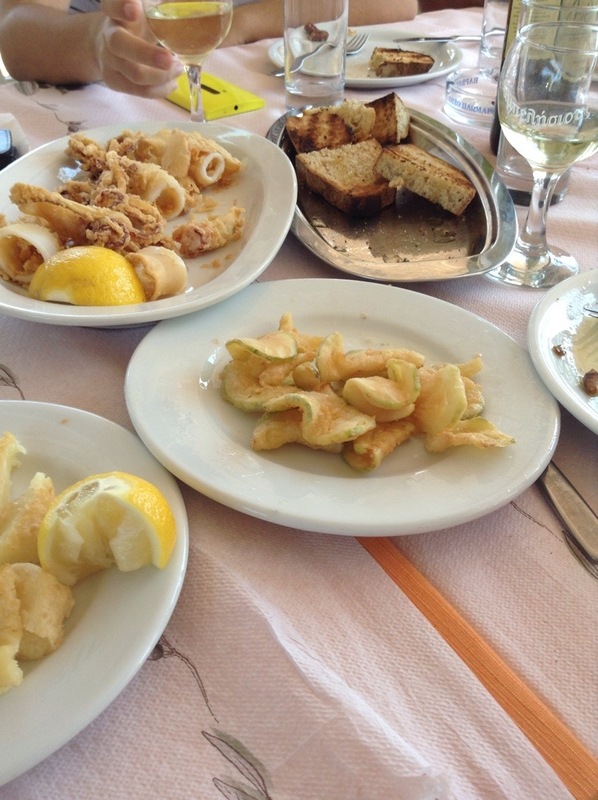 We started lunch with platters of fried, thinly sliced zucchini so crisp they snapped at the bite. NOT easy to prepare! Right behind them came bowls of Greek salad full of deep, red tomatoes so sweet you’d think they had been sprinkled with sugar. 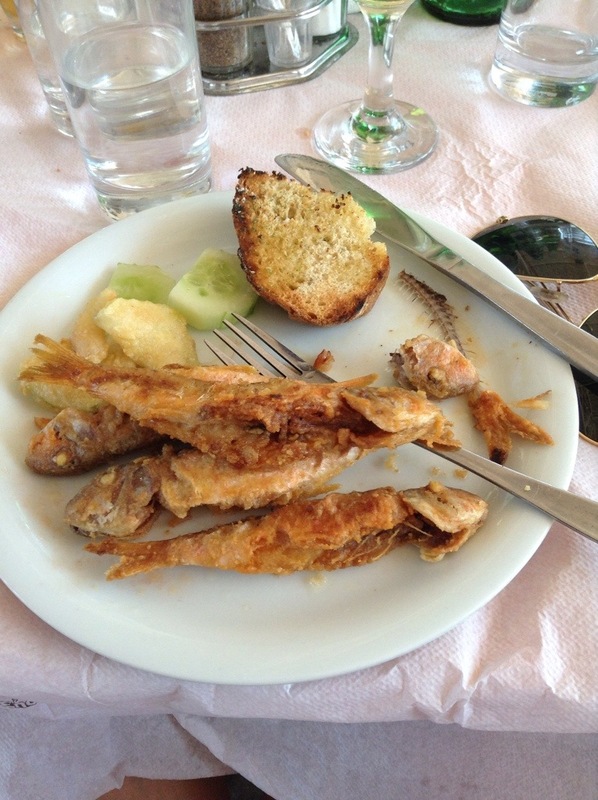 We had fried calamaria, which we usually have grilled, and it was prepared to perfection. Barely a crunch of thin, thin batter covered the tubes and tiny tentacles. Hot, melted Saganaki cheese came out oozing and bubbling on the plate ready for a bright spritz of lemon and a chunk of crusty Greek bread. And just when I thought I could dig in I turned and saw another platter to pass…zucchini blossom fritters dusted with a fresh shaving of salty Mizithra cheese. I thought I had died and gone to heaven. I didn’t know if I should eat everything, just gobble it all down or pace myself for more incredibly good food. That decision was made for me when a mammoth vessel of Red Mullet, just brought in by the captain of the boat bobbing at our feet, was set in front me in all its crispy, fried splendor. We all reached and passed. My first taste was heaven until my brain registered heat in my mouth and hands. Well worth it! Red Mullet, called Barbounia here, are small, local fish redolent with sweet, white meat. They are positively glorious and as in the song, “will make a blind man talk about seeing again!’ As I sat back, fat and happy, I took stock of my surroundings wanting to sear into my memory bank everything about the afternoon. The sun glittered on the water, the stiff breeze swept over me cool and fresh, and all these people were so happy to see us. 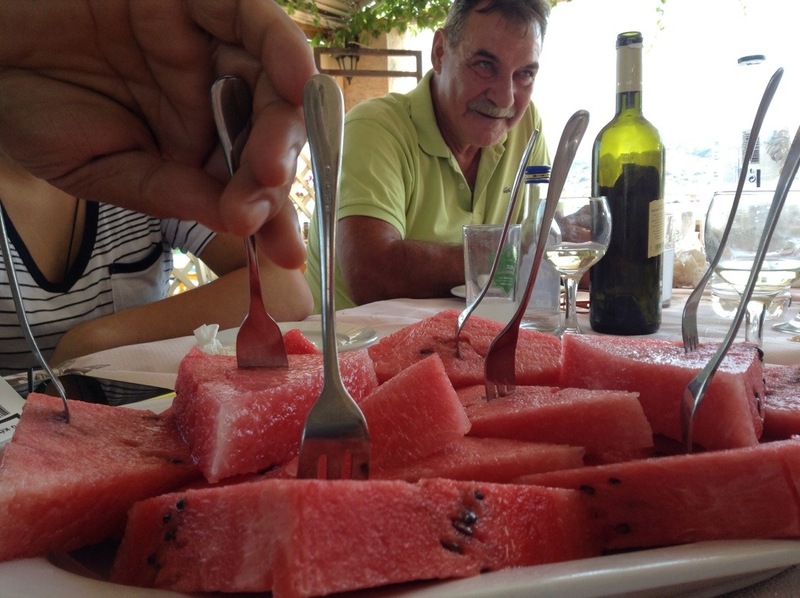 Good food and contentment…this is MY Mediterranean Diet! Panayiouda, an absolute jewel of a town. Three perfect roses to celebrate our anniversary. Each representing a member from our family of three. From sweet, sweet Athina. 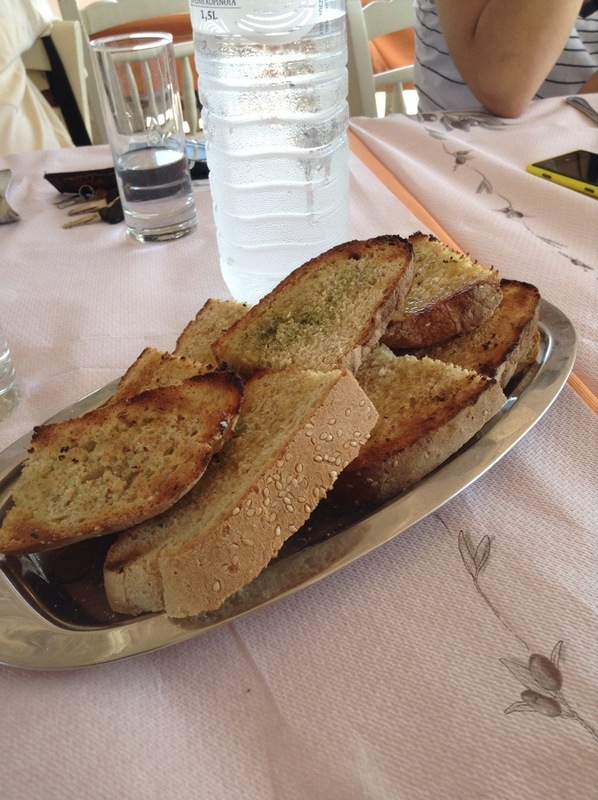 Grilled bread with a drizzle of olive oil and a shake of local oregano.
. Barbounia! My favorite fish here.
. There is never too much watermelon! Karpouzi!! Yum. And look at those zucchini chips. Could they get any thinner? Could the batter be any lighter? Heaven.